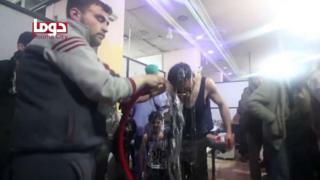 The World Health Organization (WHO) has demanded "unhindered access" to Douma in Syria, to check reports from its partners that 500 people have been affected by a chemical attack there.The Syrian government denies being behind any use of chemical weapons.The US has threatened a "forceful" response to reports of an attack but Russia has called this a "pretext" to attack its ally, Syria.The WHO cited reports that 70 people had been killed. It said its "health cluster" partners reported that 500 people had suffered symptoms consistent with exposure to toxic chemicals, including difficulty breathing, irritation of mucous membranes, and disruption to the central nervous system. "Two health facilities were also reportedly affected by these attacks," the WHO statement continued. Why is there a war in Syria"WHO demands immediate unhindered access to the area to provide care to those affected, to assess the health impacts, and to deliver a comprehensive public health response." What happened in the suspected attack? Syrian opposition activists, rescue workers and medics allege that the attack on Douma in the Eastern Ghouta was carried out by government forces using bombs filled with toxic chemicals.The Syrian-American Medical Society said more than 500 people were brought to medical centres with symptoms "indicative of exposure to a chemical agent". It said this included breathing difficulties, bluish skin, foaming mouths, corneal burns and "the emission of chlorine-like odour". The estimates of how many people died in the suspected chemical attack range from 42 to more than 60 people, but medical groups say numbers could rise as rescue workers gain access to basements where hundreds of families had sought refuge from bombing.The French representative at the UN Security Council said poison gas had deliberately been used as it could seep down to the basements.Following the alleged attack, Syria and Russia reached an evacuation deal with the Jaish al-Islam rebels, who up until now have been holding Douma.